COMBINED IQ OQ PQ PROTOCOL. This combined IQ OQ PQ protocol has been produced in response to several hundred reader suggestions we received in our ‘Suggestions Section’. This integrated protocol has been carefully designed to make it the preferred choice for Process and Laboratory stand alone equipment. It is an interactive sixty three page protocol that runs to approximately seven thousand words. It is presented in 'MS Word' to facilitate ease of final editing by the end user. The IQ section in the combined iq oq pq document establishes documented verification that key aspects of the equipment adhere to approved design intentions and that the recommendations of the manufacturer have been suitably considered. The OQ section of this jointed protocol establishes that there is documented verification that the installed system functions as specified and that there is sufficient documentary evidence to demonstrate this. 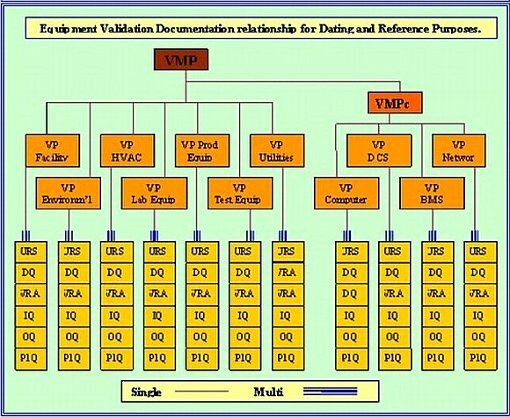 The PQ section of this jointed protocol gives documented verification that the equipment performance in its normal operating environment is consistently and precisely as specified in the user Requirements Specification (URS). 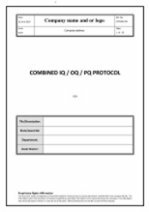 This Combined IQ–OQ-PQ protocol is a really easy and attractive document to use. It is prefaced by a 10 page SOP, which enables you to follow the SOP instruction and progressively (page by page) convert this fully detailed template into a superb Combined IQ-OQ-PQ protocol. This protocol is targeted at equipment and is suitable for all equipment from the laboratory to the process line. All standard verification's are already included in the protocol format and all test scripts are fully documented and referenced. Our unique combined IQ-OQ-PQ design was developed by a team of pharmaceutical consultants working across the pharmaceutical, medical device and bio-technical industries. These consultants covered all the validation disciplines and collectively pondered long and hard to come up with a design that would be acceptable to all users and highly cost effective for companies. Now this new combined IQ–OQ-PQ protocol brings a refreshingly simple and attractive approach for the industry professional, enabling them to raise professional quality validation protocols in a very efficient and cost effective manner. 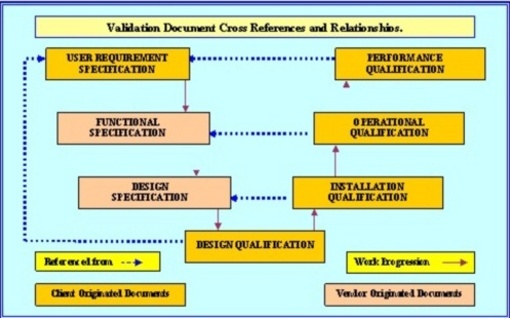 The V chart shown below indicates the relationship between the various validation documents and protocols. It can be easily recognized that each of these documents and protocols play an essential role in the validation task. All these documents must be considered mandatory in the majority of instances.